Desired Delivery Timeframe * Each chair lift will take approximately 6 weeks to refurbish and deliver. This timeframe will vary depending on delivery location. Please select a date that is at least 6 weeks from order date (today). Categories: Ski Chair Lift Bench, Ski Chair Lift Furniture. We have the beautifully refurbished Ski Chairlift Bench for sale here. The Ski Lift Chair makes the perfect addition to any outdoor leisure area. Wherever you choose to install, this piece of furniture is sure to become a family favorite, providing the perfect setting to create many happy memories for years to come. The Ski Lift Chair Bench provides functional décor for any outdoor leisure or entertainment setting and is a great alternative to the Ski Chairlift for people who prefer a freestanding unit rather than the suspended, swinging option. The bench unit proves as popular as the Ski Lift Chairs, and are restored and crafted to the same stringent standards as applied to all our Ski Lift Furniture. Dimensions are the same as the swinging lift chairs, except for the inclusion of 18” legs. Only the sturdiest of decommissioned units are selected for restoration, and a stringent refurbishing process is adhered to ensure that all benches are both safe for use and also, cozy and aesthetically pleasing in any setting. Steel frames are sandblasted to remove rust, treated with a two-part epoxy coating to prevent corrosion, and finished in a standard matt black. (Additional colors available as optional extras). Maple wood slats are replaced where necessary, sanded to a smooth finish, stained and varnished by hand to revive the original rich natural finish. (Upgrades to Mahogany or Teak finishes also available as optional extras). Fashioned from fine Maple Wood slats, milled in-house and solid steel frames, these benches receive absolute care in construction, getting finished to stringent safety standards with superb finishes that will satisfy the most discerning tastes. Standard Black Finish (Color upgrades available as optional extras). You can customize your unit by opting for custom color finishes on your unit’s steel frame or choosing a different wood finish for the slats, such as Teak or Mahogany. These options are available as upgrades from the standard black finish on the frame and the natural Maple wood finish of the slats. As is, the Ski Chairlift Bench provides stylish seating. It creates an inviting focal point on your veranda, bringing romance and ambience to any setting. You can throw in some finishing touches of your own once your unit is installed, by adding some soft cushions if you like. 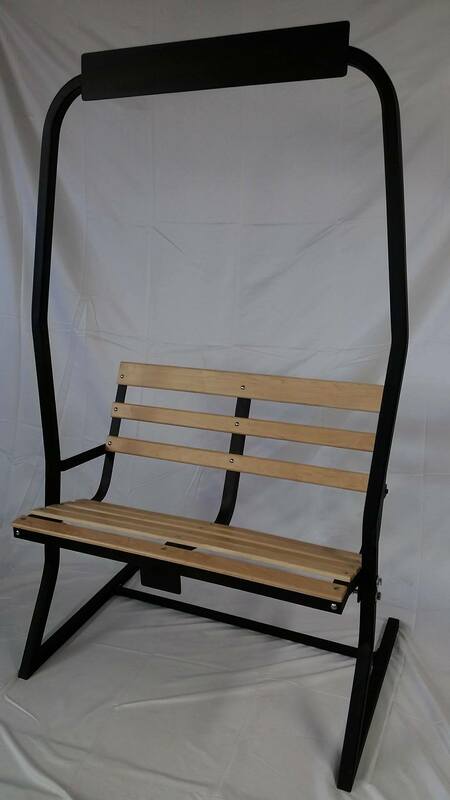 Order today your Ski Chairlift Bench for sale today.